The structure diagram represents logical rational relationships between a person’s philosophical presuppositions, their values (shown as the “superstructure” and “Life Details”), and fulfillment in their life. This structure does not represent other aspects of people’s personalities, especially their whole emotional makeup. It only addresses the rational part of a person and shows logical connections between ideas. Just as the superstructure and roof of a building depend on the foundation, life’s details and the quality of life depend on a person’s presuppositions. 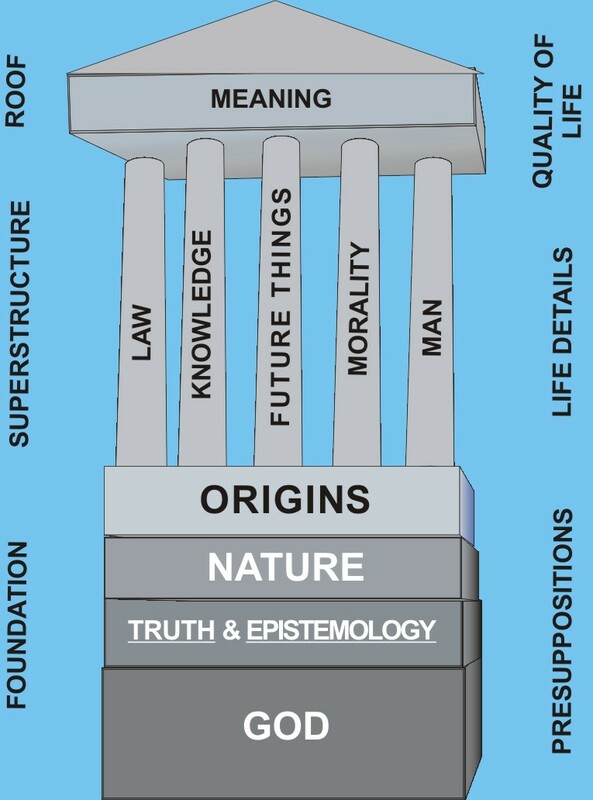 In the structure drawn here, there are four levels in the foundation of the world view of any person. This diagram is meant to be true for any kind of belief system. This has to do with whether someone believes there is a god or not, what he is like, how he relates to men, what his purposes are. Is God all good or both good and bad? Biblically God is all good. Is God in complete control of events in history? Does God judge mankind’s sin? What has God done to provide a solution to man’s sin? One's view of God (including the view that there is no god) has far-reaching implications and colors much of how we think. This part of the foundation of our thinking is extremely important for understanding many things about our society and about how people think and believe. On the question of Truth, one important aspect is how compartmentalized is someone’s thinking. Based on the Bible, revealed truth in Scripture is authoritative in all topic areas it speaks to. Some would think of their Christian faith as separate from issues of science and so there can be no implications for science of believing the Bible. But in Biblical Christianity, truth is a rational logical coherent unity. Truth does not have compartments, it is just that we think that way because we are limited and because our educational system tends to teach us things that way. Biblical Christianity says Scripture gives absolute truth that is true for all people, and binding on all. Or, is one belief system just as good as another? And how do we judge what is true (epistemology)? Is it from revealed Truth or by from our own reason and experience? Are there limits to what man’s reason and ingenuity can learn? This part of the foundation deals with what kind of sources people rely on for answers. Do we rely on human reason and scientific/systematic methods of learning truth, are personal subjective experiences a guide to truth, and is there such as thing as revealed truth (revealed from a Creator-God). What is our relationship to Earth and Nature? Is Nature intelligently designed by a Great Intelligence? What is the meaning of the beauty and order in nature? And what is the meaning of the disorder, the harshness, the imperfections, and the cruelty of nature? Does the physical natural world have value and a purpose for it’s existence? If so, what? Some world views hold that what may be called "God" and even what may be called human personality are not separate from Nature. Should human beings consider themselves as rulers over Earth and superior to other life forms or as just another animal who happens to be smarter. I believe the Biblical view of history has the best answers to these questions. The world was created good, and so was mankind, but when sin entered the world this affected not only human experience but it changed nature itself. Thus we do not live in a world that is the way God first created it, we live in a fallen world, on a planet that's been affected by the sin of mankind. God's goodness is still shown in the way nature is made, but there are things about it that are abnormal, which God will one day restore to something similar to his original creation. Has Nature come about by natural processes, was it created by many gods, or was it created by one all-powerful Creator-God? Are we humans products of Nature as in evolution or is our origin and purpose separate from animals and other life forms? This part of the foundation of our thinking has to do with how the universe got here, how our planet got here, and how we came to be as we are. It is sometimes hard to distinguish between one's view of nature and one's view of origins. Where do we humans get our uniquely human abilities (i.e. spoken languages, making moral judgements)? And what is the cause of man’s condition, morally and spiritually? Is human behavior a result of having evolved from simpler life forms that behaved in a similar manner? This part of the foundation is very important in our thinking because it has significant implications about what it means to be a human being. The question of what the ultimate purpose is of our lives is very dependent on our origins. How we cope with the details of our lives depends on how we view who and what we are. Important aspects of life’s details revolve around our view of right and wrong, our view of science and human knowledge, law, and our beliefs about future things. All these things motivate and guide us in many ways. In Christianity, the moral absolutes laid out in the Bible provide an unchanging basis for law in society. God’s plan of redemption through history and his working out of future events, as described in the Bible, is not fully understood without an understanding of our origins and the events of the early chapters of Genesis. What does it mean to be human? Are humans moral beings? If so why? If not, why not? Can we know God? Though we humans are intelligent we are finite creatures. If we evolved from lower forms of life, how does that have different implications from the Biblical concept of being made in God’s image? How sure is our knowledge? Is there some of it that’s more certain? Why? Biblically, human beings are created in God's image. I think the most important meaning of this is that humans were created with the intelligence and other qualities to be able to have a relationship with God and have a part in what God does in history. We are both limited and weak but yet capable of great accomplishments. According to Genesis humans have an origin completely separate from all other living things. From the Biblical account, humans did not come from the Earth or come from lower animals. However we were made from the dust, but made supernaturally in a manner unlike any other life form, and put in charge of the Earth by the Creator. In a Christian view, there is certain truth that comes from revealed truth in the Bible, but this does not change the fact that man can discover things about the world from his own investigations as in science. Things learned or thought of by man can never have the authority or certainty that revealed truth has. So there is great value in the systematic methods of science and logic, but it is tempered by the fact that we are imperfect, finite creatures who don't know everything. The moral principles and moral absolutes from Scripture give us an unchanging basis for what law should be like. But this includes consideration of cultural differences and the differences between individuals because all people are valuable as made in God's image. In Christianity there is also a sure basis for hope for the future, which revolves around the sinless Son of God returning to Earth. When a person deals with painful or difficult personal issues in life, the emotional pressures can overwhelm their ability to think about issues like what they believe. But on the other hand, going through painful or disappointing experiences can lead a person to seriously question what they believe. Thus it is important to know why we believe what we believe. Christian apologetics is important for Christians. It can give a kind of objective foundation that doesn’t change as feelings and circumstances vary. When emotional issues have been worked through then intellectual questions can remain that relate to the reality structure in the above diagram. Life’s difficulties force us to make choices about what we will believe about God, truth, the universe, and ourselves. Difficulties make us choose how we will cope with painful issues and they make us choose how we will think. Biblical Christianity provides the best answers for life’s major questions. For Christians, understanding the Christian world view can help us understand ourselves and others. It can help answer the questions of nonchristians, or even the questions children ask about life. Love and fulfillment are not only emotional things, they depend to some degree on having realistic answers to life’s major questions. Caring for others has to be motivated by more than a brief feeling of the moment. Christianity is true to the way things are in the real world and true to human experience. No other belief system is as satisfying both intellectually and in personal experience. Many belief systems may produce some positive changes in the lives of people, but those changes have inherent limitations. They may not last or they may leave a nagging emptiness because they don’t provide a final hope for eternity. Nonchristian belief systems do not stand up to the scrutiny of good scholarship, they may not fit the facts of history, they are often not something people can really live out in practice, or they may be harsh and not compassionate about the needs of people. Christians themselves are far from perfect and so are churches. But the problems of Christians do not make Christianity any less true.